Motionless, Suzanne gazed across the river at exploding images of destruction and despair as the city she called home had just been shattered. Staring at the billows of smoke that now engulfed downtown, she realized that the world had changed forever. This was not a scene from some far away war torn place. This was New York City. Her countryâ€™s freedom now under attack, Suzanne finds herself without a job and without a purpose. Finding a severance notice in her inbox, she leaves behind her comfortable executive lifestyle and journeys alone beyond her comfort zone to liberate her spirit and claim personal freedom. 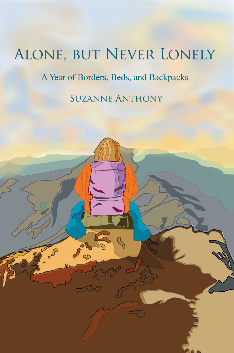 Traveling with a sense of adventure in her heart and only what possessions she can carry in a backpack, she finds her way to the far corners of the world where few have ventured. Suzanne takes us on a rich, personal odyssey, returning home one year later to Ground Zero where it all began. As she returns to her beloved city, she is filled with renewed purpose, a broader perspective of the world, and a greater understanding of herself and humanity. Ok I found it. It’s mine!! dowloaded Kindle just because of you! … just got your book and am enthralled! I had no idea you were there experiencing 9/11 … I can see I’ll be up a bit late tonight! I had to take him to school ~ we turned the radio on ~ I came back and was glued to the TV … surreal~ absolutely just couldn’t grasp what was happening… no one could ~ the second towere … the Pentagon and the third in Pennsylvania … very very scary~ still is~! Just subscribed to your blog after learning of you through your meetings with Nina and Paul. I love your free spirit and philosophy on life and just downloaded your book. Can’t wait to get started on it! Looking forward to coming along on your journey. Just finished your book, wonderful read. Just purchased and read your book. I loved it. Thanks for taking me on your travels through merriment, laughs and wonder. You are so funny! Looking forward to your next travel book. Just found your blog and plan to follow along, esp. with any woman traveling solo as that will be me if/when I can launch my RV lifestyle. I already travel the world solo and love it. Have never been afraid, however, do wonder about the safety of being a solo RV woman in the US, Canada, etc.. Hope to buy and read your book…don’t have a Kindle, can I read it on-line for a price? Very sorry to hear about the loss of your brother. Any chance of getting an email whenever you have a new posting? Thanks and a virtual “hug” in your time of sorrow. We enjoy our 2015 Siesta but driving through Arizona the A/C can’t cool the cab area. My wife made a quick fix by tucking about two feet of a blanket under the cushions of the above sleeping area and letting the blanket hang down behind the driver/ passenger seats. Wow what a difference the cab is cooler and I can turn down fan speed while maintaining a comfortable temperature. The hot sunshine of Az has dulled the front plastic top of my 2015 THOR Siesta RV. Any idea on how to remove the oxidized dull area and make it shine again?